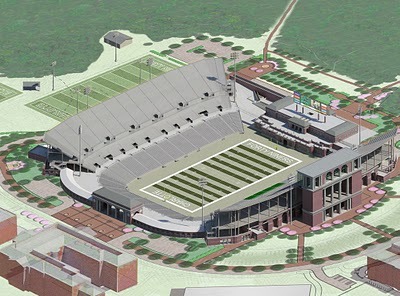 The football stadium will start out with 15,300 seats with the ability to expand to 40,000. You can tell the new team is on its way when you see not only the tuition prices going up, but you see more fan memorabilia in the stores around the area. 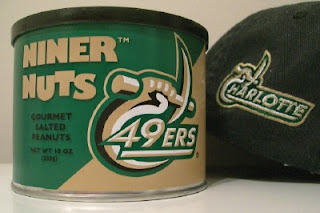 Just the other day I found these cute "Niner Nuts" sitting on the counter right next to the others cans for UNC (#1), NC State, and Wake Forest. I hope eventually they will be right up there with the big boys and I will have a new team to cheer for. The next thing I did was sent a can of these to our friends that live in New Jersey. There daughter also goes to UNCC and is my daughters best friend and former roommate. I think they will get a laugh out it. Now what did I do with my Carolina cup? thank you guys so much for the can of nuts! love having a little bit of the south here in jersey! now...gonna go do some munchin'! thanks again!